This is the tool I use. I like the pen shape making it easy to push the fibers into the background fabrics. When felting appliques, you can drag the needles back toward the applique (like a rake) to ensure clean edges. The needles are replaceable, if you break one. Breaking needles is caused by NOT inserting the tool at 90 degrees to the surface. So don't do that! Also keep track of that tool cover. 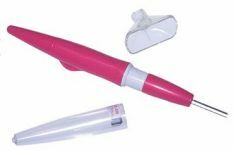 You will need it when you aren't using the felting tool. The needles are extremely sharp. The heavy weight needles by Clover are a good choice. They last longer than the ones in the tool when it is new. They are equivalent to 38 guage needles. The fine needles are 40 guage. Open the top (longer) end of the tool to replace the needles. You will also need a piece of foam to felt into, or you will stab you leg. I use the heavy weight replacement needles in the tool and singly for detail work. The fine needles make smaller holes, but the holes disappear after a short time, so I don't think this should be a concern. People who make 3-D animals with felting needles tend to prefer the fine needles. How does a felting tool work? The needles have barbs on them. 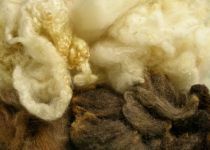 Roving is wool fibers combed in the same direction. The fibers have barbs on them if you look at them under a microscope. The action of poking the roving into the wool fabric causes the fibers to get hooked together, making felt. You can felt ears or tails in 3-D by felting onto both sides of wool fabric then using scissors to cut out the proper shape and felting the side that you want to attach to the animal applique. You can get some amazing detail with needle felting that is totally different from wet felting which requires a fair amount of elbow grease or felting on a felting machine. You can also buy an attachment for your sewing machine to felt. Most people dedicate that machine to just felting rather than switching back and forth between felting and sewing. Felting tool or tool and foam?